Dr. Joseph Lee has performed over 70, 000 Lasik cases over the past 17 years. Dr. Lee has the cleanest record for any Lasik doctor in California who has performed a similar number of cases. Dr. Lee has the most and best reviews (for lasik) on Yelp.com in the U.S. Check out the Elite reviews. No Lasik Doctor in the U.S. has nearly as many Elite reviews on Yelp.com as Dr. Lee. Dr. Lee graduated from the University of Michigan Medical School, a top ten U.S. Medical School. He completed his fellowship in refractive surgery from USC/Doheny Eye Institute. Dr. Lee is also an inventor of a brand new golf product, Swingbox™ . It is unrelated to Eye Surgery, but if you love golf, you will love his new product. It is the world’s best indoor golf net. Dr. Joseph Lee received LASIK training in a two year refractive surgery fellowship (at the prestigious Doheny Eye Institute/USC, now UCLA). Dr. Lee obtained the fellowship through a competitive match of over dozens of very qualified applicants, . Dr. Lee trained under the American Academy of Ophthalmology’s Refractive Surgery Interest Group Chairman. Dr. Joseph Lee is Board Certified (Diplomate) by the American Academy of Ophthalmology, the largest certifying body for eye surgeons. At the age of 20, Dr. Joseph Lee scored better on his MCAT than the average of accepted students at Harvard Medical School (data from 2005). On the MCAT, Score of 13 on Science Problems. Dr. Joseph Lee scored 97 percentile on his Board Exam Part 1 (better score than 97% of all physicians that year) on his National Medical Boards, which is taken by all U.S. physicians. If you Google “dr lee lasik”, you will find that Dr. Lee is consistently in the top in the world in the google ranking. For the past several years, Dr. Lee has been Number 1 in the google ranking under this particular search (from 2006 to 2015). Lasik Eye Center is the FIRST laser center to be established in this local area. Dr. Joseph Lee has personally performed over 70,000 LASIK procedures, not including other microsurgical ophthalmic procedures such as cataract surgery, corneal transplant surgery, glaucoma surgery, astigmatic keratotomy, PRK, and LASEK. Among the hundreds of surgeons performing Lasik in California, less than a handful of surgeons in California have performed this many cases in the past 17 years. NO other surgeon in California has personally performed the pre-op evaluation, laser calibration, lasik surgery, instrument cleaning, and post-op care for over 70,000 lasik cases. Dr. Lee has the CLEANEST record of any surgeon who has performed 70,000 lasik cases in California. Dr. Joseph Lee has performed Lasik on over 30 Lasik Eye Center employees. Dr. Lee has performed Lasik on over 700 physicians. Dr. Lee has performed Lasik on hundreds of dentists (including three dentists in one family). Dr. Joseph Lee has performed Lasik on many close family members, including his wife (also an ophthalmologist), mother, father, brother, brothers wife, wife’s brother, and wife’s sister. Those cases included high myopia (approx. 9.0 D), and high astigmatism (-5.0 D). Dr. Lee owns ten excimer lasers, including the Nidek EC-5000 and the Visx S-4 IR Customvue wavefront lasers. Very few doctors own even 2 excimer laser machines, and often doctors have their laser machines only on consignment (pay the company a much higher fee per procedure performed). Dr. Lee operates at THREE locations; he is the only Lasik surgeon at all three locations. Dr. Lee is the CEO of Fegi LLC, a company formed to build a 100,000 sq. ft. building in Buena Park, on Beach blvd. (approximately $20 million project). Dr. Lee was featured in EyeNet (published by the American Academy of Ophthalmology) Vol.3, No.5 – “Intacs Rings a Bell for Refractive Innovators”, May 1999. Grant: National Eye Institute, SBIR Phase I grant, Principal Investigator. An Adjustable and Reversible Implant for the Correction of Myopia – March 1999. Dr. Lee won a very prestigious SBIR grant; the National Eye Institute chose Dr. Lee as one of only a few companies in California that year to receive a $100,000 grant based on Dr. Lee’s discoveries in refractive surgery, as a student. Featured in EyeWorld – “Dr. Lee introduces an in-situ adjustable corneal technology to increase the predictability of refractive procedures”, January 1999. Awarded Best Paper Presentation, Pre- American Academy of Ophthalmology International Society of Refractive Surgery meeting, Refractive Implant Session, November 1998, as a resident in training in ophthalmology. Invited to Present at the “Late Breaking Refractive Surgery News”, American Academy of Ophthalmology’s Refractive Surgery Symposium, November 1998; only 4 other internationally reknown refractive surgeons were invited to speak for that Late Breaking Refractive Surgery News session; Dr. Lee was invited at that time when he was only a resident in training. Extensive experience in innovating new refractive surgery techniques. Dr. Lee has authored over 12 United States Patents in the area of refractive surgery. Six of Dr. Lees patents have been issued by the United States Patent and Trademark Office. Most physicians have not even received one patent. Dr. Lee was pioneering a new refractive technique that was recognized by top U.S. laser surgeons including Dr. Marguerite McDonald (first human PRK in the world) who has referred to it as Dr. Joseph Lees brainchild as one of the techniques for the new millennium. 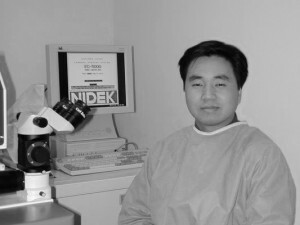 Dr. Joseph Lee’s research and innovations in laser vision correction has improved outcomes for ALL Nidek excimer laser surgeons (as acknowledged by Nidek Corporation in a letter to Dr. Lee), over 1000 lasers and an estimated 1500 refractive surgeons. Dr. Lee awarded $40,000 value Warranty for his research with the Nidek Laser (from Nidek). President of Tri-County Eye Society, 1999-2000. Dr. Joseph Lee has personally calibrated the laser for each patient he has performed LASIK for. Typically, a laser is calibrated for every TWO OR THREE LASIK patients and usually calibrated by a technician. LASIK EYE CENTER owns several independent mobile laser power/energy monitors that it keeps ON-SITE to re-calibrate the laser calibration system itself, as needed (98% of laser centers do NOT own one). Dr. Joseph Lee has personally washed and sterilized the Lasik instruments for each Lasik patient he has performed surgery on. Usually, a technician washes the instruments. However, a poorly washed instrument can cause inflammation after Lasik. Because Dr. Lee personally maintains the Lasik instruments, in over 70,000 Lasik cases at LASIK EYE CENTER, Dr. Lee has not had a single case of central DLK following Lasik. Dr. Joseph Lee personally inputs every patients data into the laser computer and rechecks it three times, avoiding a mistake that might be made by a careless technician.